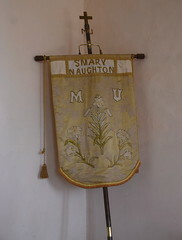 Naughton is a tiny village not far from Bildeston. A memory of a visit some ten years previously came back to me as I cycled the high, lonely road from Elmsett. It had been an afternoon in late autumn, and I remembered passing small groups of men in green carrying broken shotguns, tired-looking dogs panting in their wake. The shoot was obviously over. 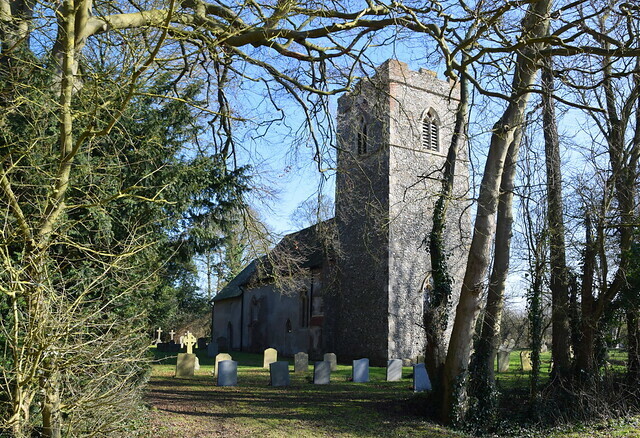 Now, on this day at the very start of spring, I arrived in Naughton and remembered the place too, the church set back from the road in a small tree-shrouded graveyard on the edge of the village green. 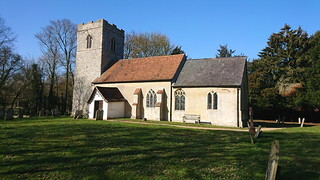 St Mary is small and pretty in its neatly clipped surroundings. The battlements of the tower appear to have been renewed, the rendering is recent, but other than that the exterior probably hasn't changed a great deal since the 14th century. I pushed open the south door, and I must admit that my memory failed me at this point, for I could remember nothing at all about the interior. 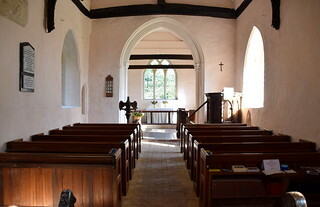 I stepped into simplicity, a church full of light with brick floors and a fine roof. 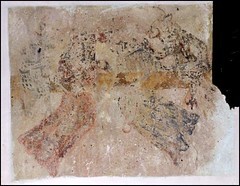 The most striking medieval survivals are the wall-paintings. 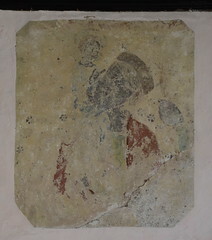 A bold St Christopher, in clean 14th century lines, was uncovered in the 1950s.The Christ child sits smiling on his shoulder, holding a scroll in His left hand. St Christopher himself tilts his head, as if lifting his right shoulder to bear the weight. The other is less distinct, a warning against gossip. Devils hovering to write down the sayings of village women neglecting their rosaries. 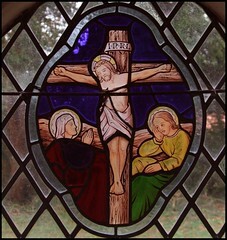 There is a fragment of the same scene across the county at Grundisburgh. 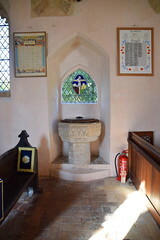 The font below has been reset in the blocked north doorway, which looks rather well, actually. 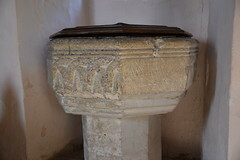 It was obviously a square Norman bowl, of a kind common in this part of the world. At some point, the corners have been cut off to make it octagonal. The view to the east is curious. 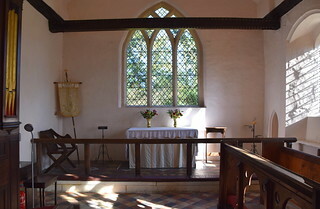 Two medieval tie beams are very low across the span, cutting off the view to the east window. 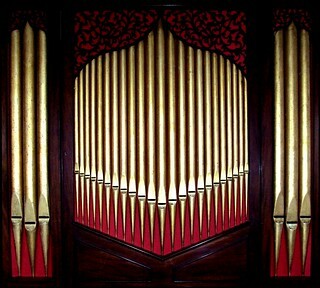 Actually, they are plenty high enough, but from the nave you have the illusion that you might knock your head on one. And a final, fascinating detail is so tiny that you might even miss it. 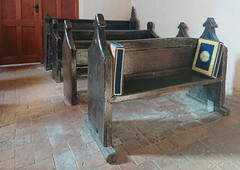 The rood screen has gone, along with the entire rood apparatus, of course. But look up high on the north pier of the chancel arch. You'll see that the moulding has been cut away from the western part of the arch to accommodate the rood loft. Even more interesting, a medieval nail still protrudes from the pillar. It probably supported the candlebeam. I sat for a while, and another memory came back to me from my visit ten years before. I'd known that this would be my last church of the day. It was nearly three o'clock, and I was a good twelve miles from Ipswich, and I don't like cycling around country lanes after dark. I'd come outside and spent a few moments pottering around in the churchyard before continuing my journey. Suddenly, there was one of the loudest bangs I had ever heard. Someone on the edge of the graveyard, about 20 feet away, had let fly with a shotgun at a rook in the tree above me. Shot scattered on the headstones around. The shooter ran in gleefully to pick up his kill, nodding but without saying anything to me, grinning broadly. Perhaps it was all he'd shot all day. And so, as then, I left. On the edge of the village, a row of houses and a garage are Nedging Tye, the ancient grazing settlement of the adjacent parish of Nedging, which has quietly melted into Bildeston itself.